Obverse: Crimson enamelled cross, bearing the royal cypher of its founder (enamelled in white) in the centre medallion. On the outer ring of the central medallion, enamelled either in dark green or white, is inscribed the name of the order – „ЗА ВОЕННА ЗАСЛУГА“ / translation: for military merit / and a small six-pointed star in between two dots at the bottom. Reverse: Crimson enamelled cross, bearing in the centre of the central medallion a crowned Bulgarian lion rampant (in most cases with superimposed Saxon shield upon his chest). On the outer ring, enamelled in either dark green or white, is inscribed “2 АВГУСТЪ 1891“ /2nd August 1891/– the date when the Order of Civil merit was founded. 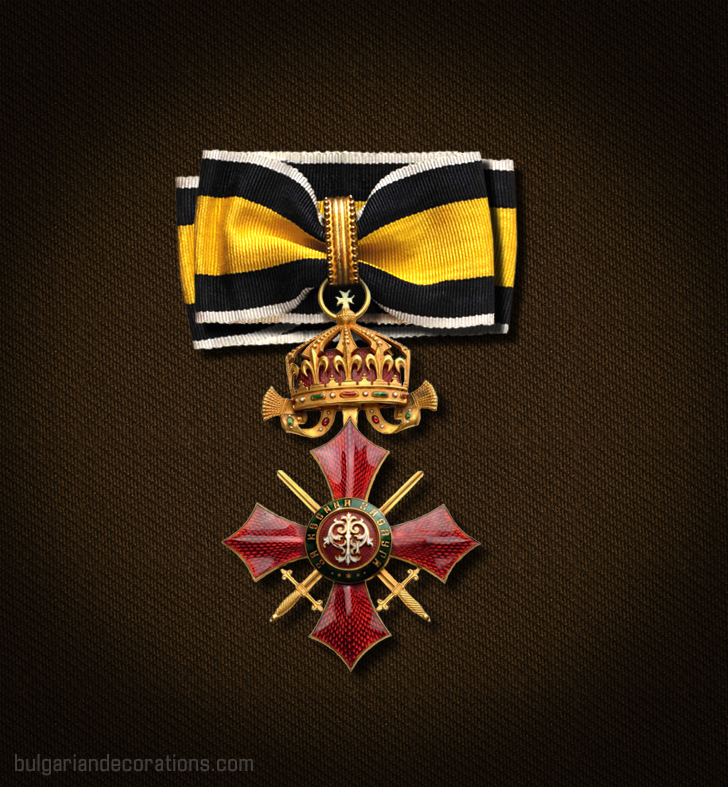 The Order of Military merit has been founded in 1900 as the military variation of the Order of Civil merit. In theory, these two decorations were two divisions of a single National order of merit. This is the reason why both of them bear the date 2nd August 1891 as the date of their foundation. 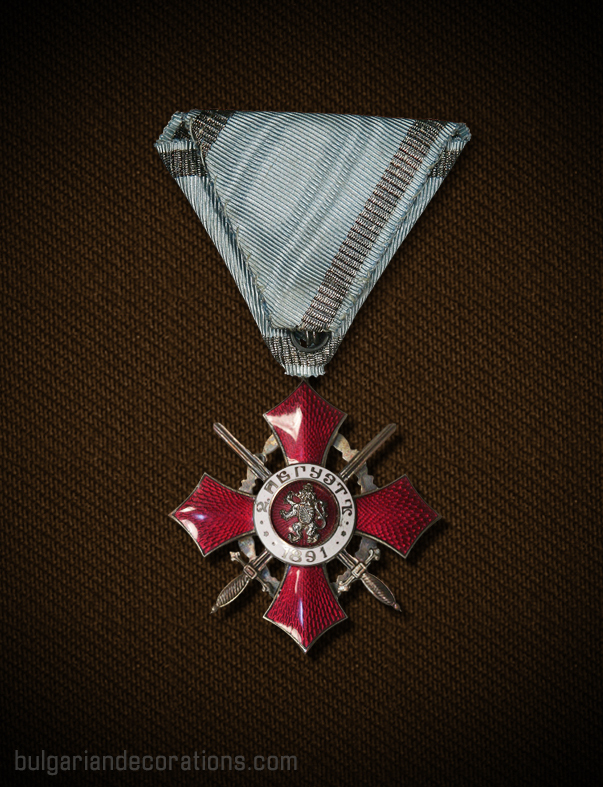 The military branch of the National Order of merit has been created in order to distinguish army men for their long and faithful service in the military and also for their feats and merits, both in the time of war and peace. During the 45 years of its existence, the order has been presented to thousands of military men – from NCOs to senior officers and generals, including a large number of foreigners. During the Balkan wars, the order has been used to decorate wartime merits of officers and enlisted men. 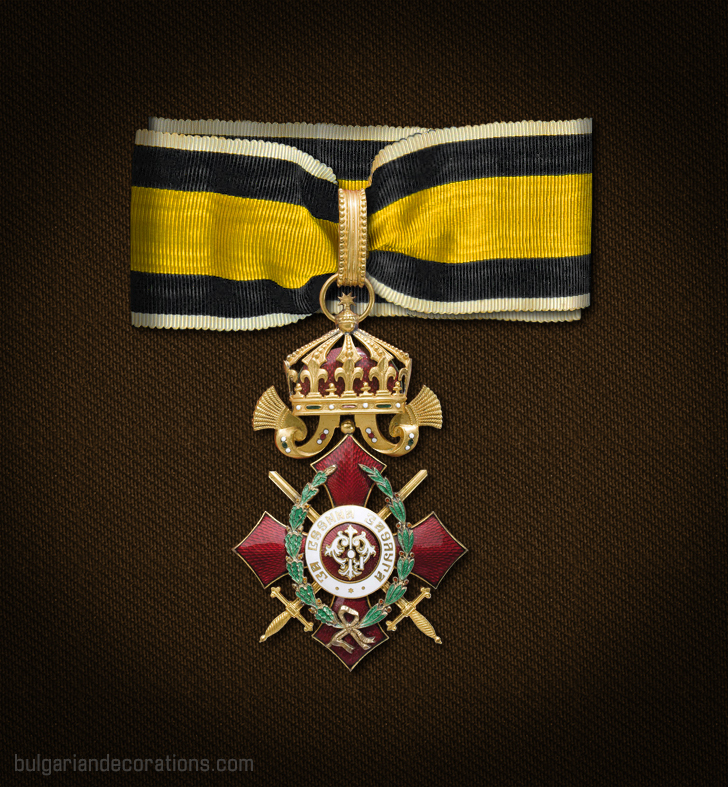 In order to indicate this, the last three classes of the Order of Military merit have started to be awarded on the sky-blue ribbon of the Military order “For Bravery” but only for frontline merits. In 1916, a new division of the order has been initiated. 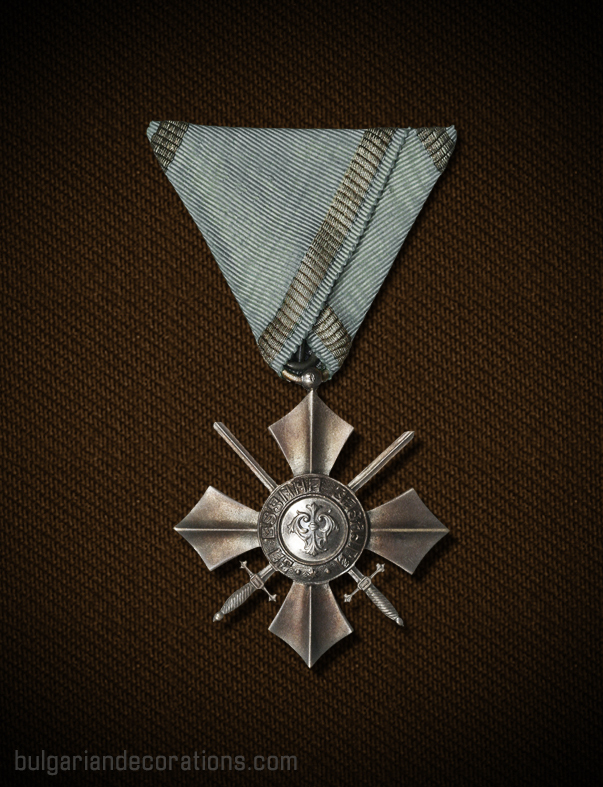 It has been implemented in order to indicate specifically a battlefield merit, in contrary to the generic type of military merit order which remained largely in use. The new division has a slightly amended design – the outer ring of the central medallion is now enamelled in white instead of green and upon the obverse of the badge is positioned a decorative circular oak and laurel wreath enamelled in green. 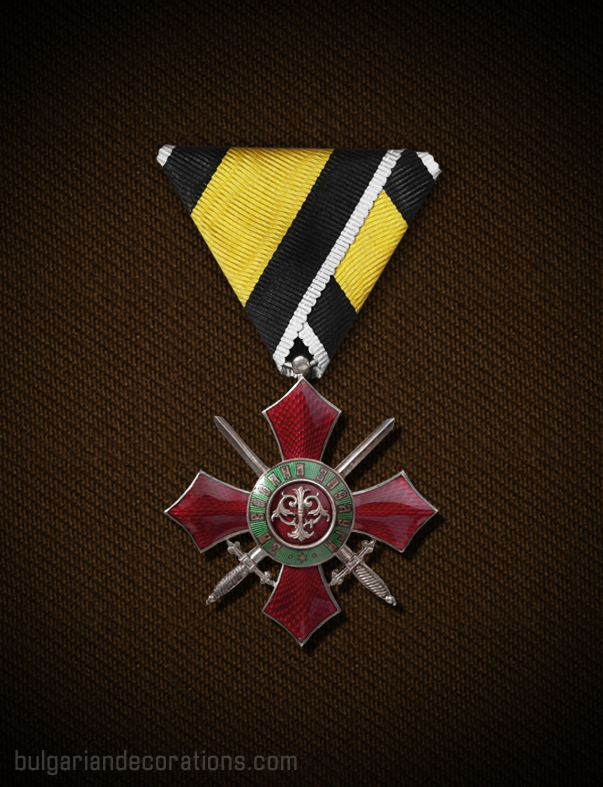 This applies for all classes of the order and any breast stars too, except for the silver cross badge. In addition to the amended design of the badge for battlefield merits, orders 4th, 5th and 6th classes of this division are always suspended from the sky-blue ribbon of the Order “For bravery”. 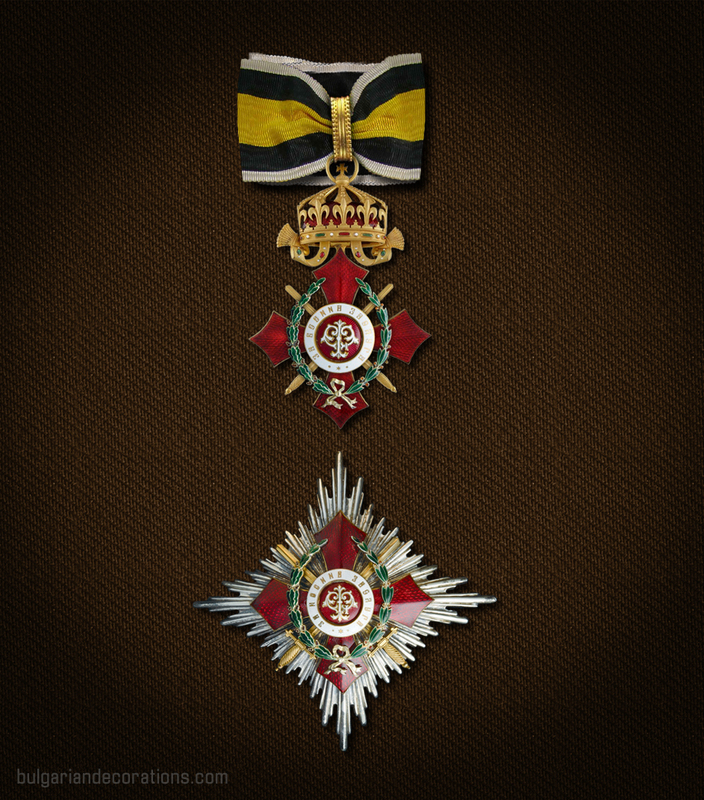 The different issues of the order are very similar to the ones of the Order of Civil merit, except for the lack of the samples with the early ‘domed top’ crown suspension. The first issue of the order is of a very high quality. The specific features are a translucent high quality crimson enamel on the arms and centre, and darker green enamel on the outer ring. The second major type actually replicated the previous but the enamel on the outer ring and the cross arms appears slightly less translucent and also the lappets of the crown suspension have been redesigned slightly. Orders of this issue have been used for decoration in both Balkan wars, the Great War and also in the interwar years, due to the limited budget and large wartime stock still present at the Chancellery of Bulgarian orders. The third master issue is the one minted during the reign of King Boris III. It bears the same features as the one minted during his father’s reign, though the quality of manufacture was not as high as the old issues. A notable and very rare issue was minted in 1937, labelled ‘flat reverse issue’. It features a flat (single) reverse central medallion bearing an amended design of the Bulgarian lion and the inscription has been amended to include the name of the ex-king Ferdinand I – “ФЕРДИНАНДЪ I 2.VIII.1891” separated via two six-pointed stars. The Grand Cross has been officially introduced in 1933. Prior to this date though, the 1st class of the order has been referred to and being awarded as a regular Grand cross decoration. 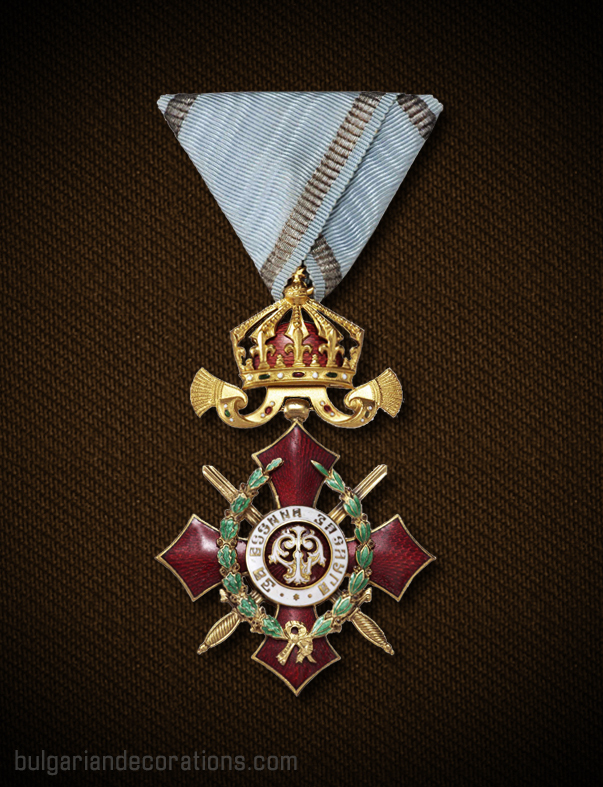 In practice, the introduction of the Grand cross badge simply meant that the existent first class was to be renamed accordingly, while in its place was introduced a Great cross badge – I class decoration. The badge of the Grand cross (I class prior to 1933) represents a 75mm (65 mm for Boris III emissions) wide crimson-enamelled gilded-rimed cross suspended form an elaborately designed, gilded and enamelled royal crown. 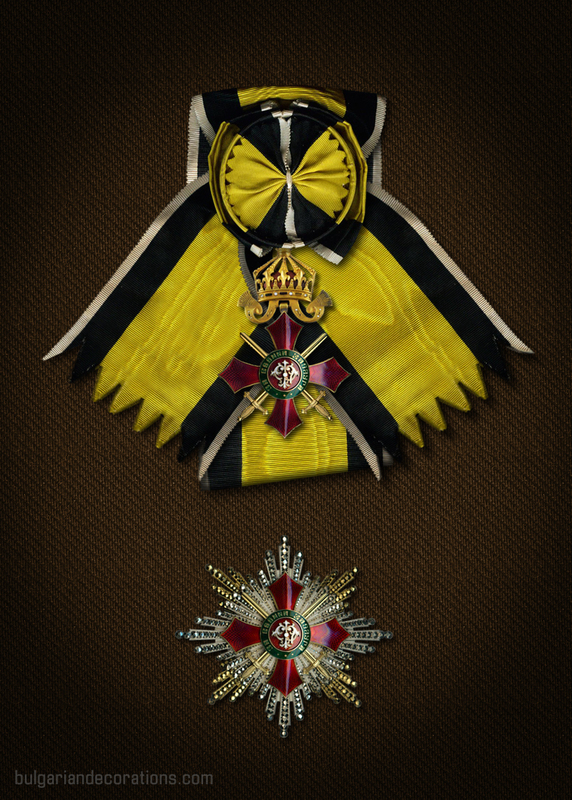 The badge is attached to a wide yellow order sash (about 10cm wide) with black and and thinner white border stripes on either side. The sash is worn over the right shoulder and across the chest, having a rosette and/or bow near its end. 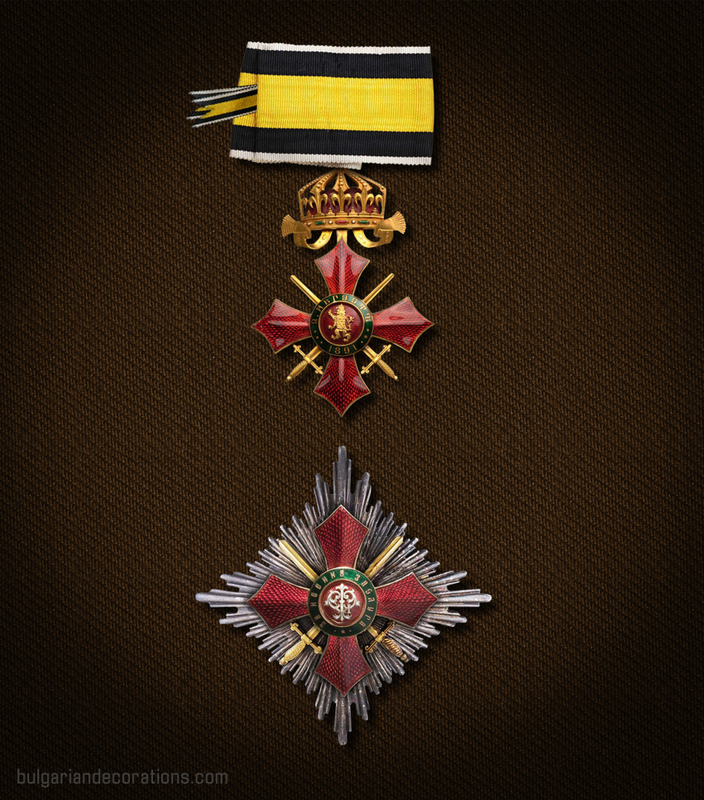 In addition to the badge and its sash, the set includes a 97mm eight-pointed star, made of four silver and four gilded alternating sets of rays. In the centre of the star is positioned the badge of the order without its crown suspension. The star is worn on the left side of the breast. In the 1930’s, a slightly amended variation of the Grand cross breast star has been introduced. It’s slightly larger in size – 102 mm and its rays are made up of series of relief beads, rather than the usual smoothed rays. 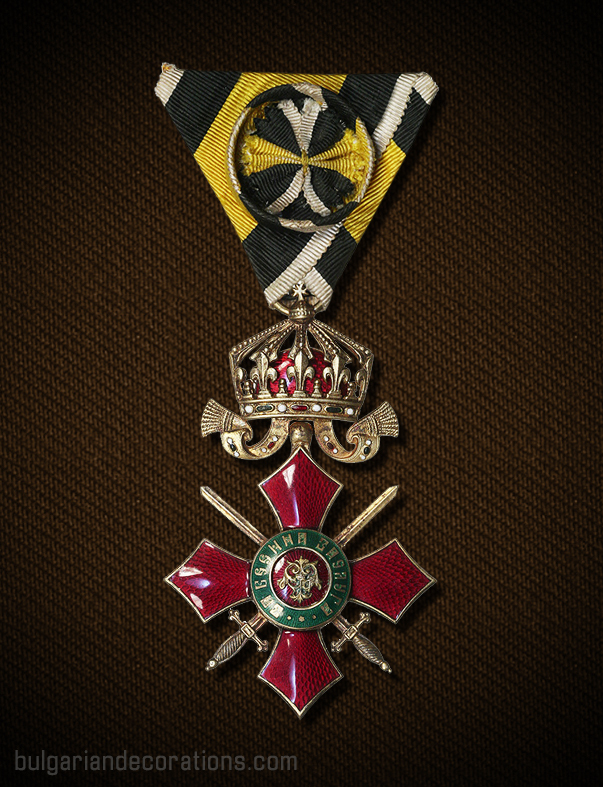 The Grand cross set (or 1st class set, prior to 1933), has been awarded to the highest-ranking officials within the army – generals, including foreign generals, rarely to non-army officials of very high rank. Until the introduction of the Grand Cross in the 30's, the highest class of the order was the first class, which was being worn and often referred to as a Grand cross decoration. 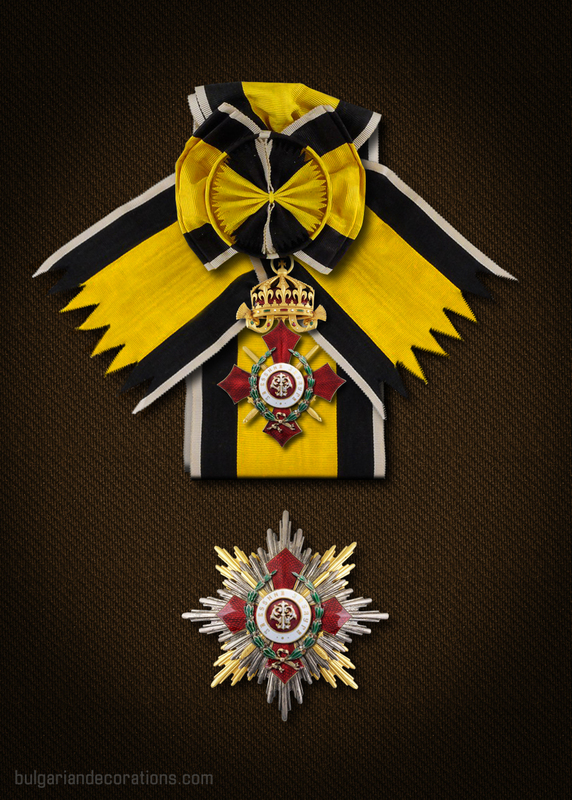 Theoretically, the transformation of the first class into a Grand cross grade meant that a new grade had to be introduced, similarly to the transformation with the classes of the Royal Order of St. Alexander in 1908. The Great cross represented a 54-56 mm wide cross, similar in appearance to the Grand cross badge, but was instead suspended from a slightly thinner order sash with slightly amended widths of the colours. It was worn again over the right shoulder. The breast star for the later Great cross resembled the generic Grand cross breast star but is a bit smaller (about 84mm wide) and all eight sets of rays are made of silver. Among the people who were decorated with this high decoration were again Bulgarian or foreign army generals. The second class of the order represents a 54-56 mm in width badge. It’s being worn on a thin order ribbon (about 40mm) suspended from the neck. 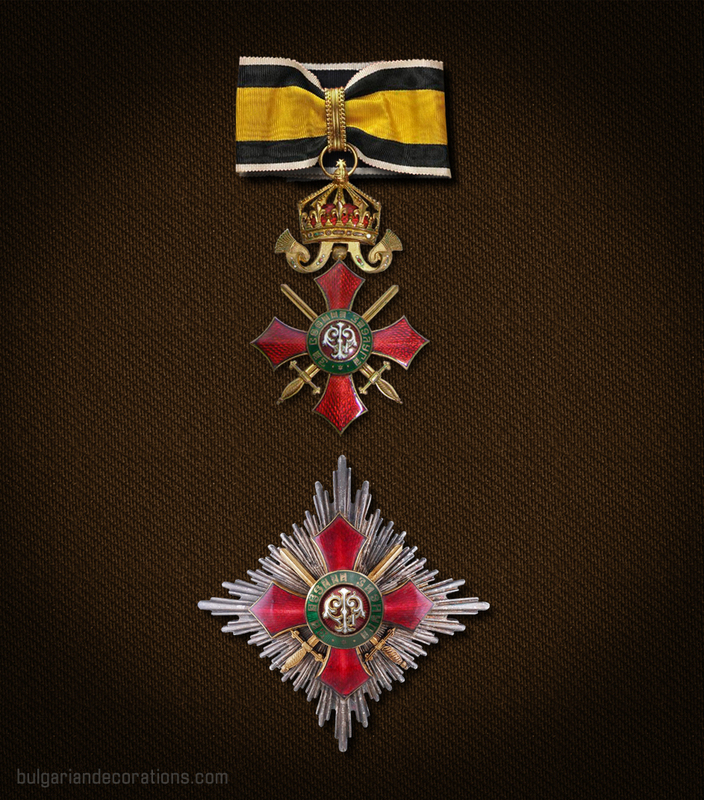 In addition to the badge, holders of the grand officers’ cross also display a rhomboid silver breast star (88 mm) made of four sets of silvery rays and the order badge superimposed over the centre. It’s worn on the left side of the chest. The second class sets have been awarded to army generals. 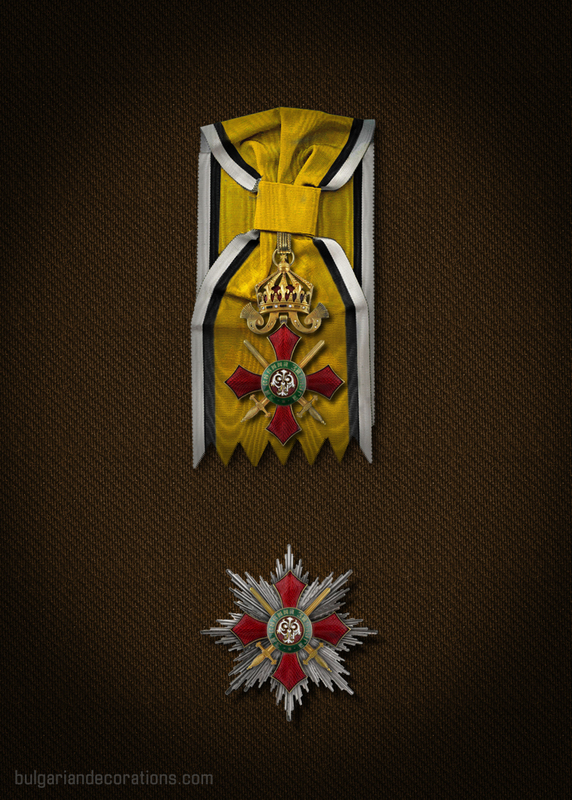 The third class of the Order of Military merit represents a neck badge identical to the one from the second class set. The difference is that the third class decorations do not come with any breast star. Again, awarding was made according to the recipient’s rank and merits - senior officers, usually regimental commanders. 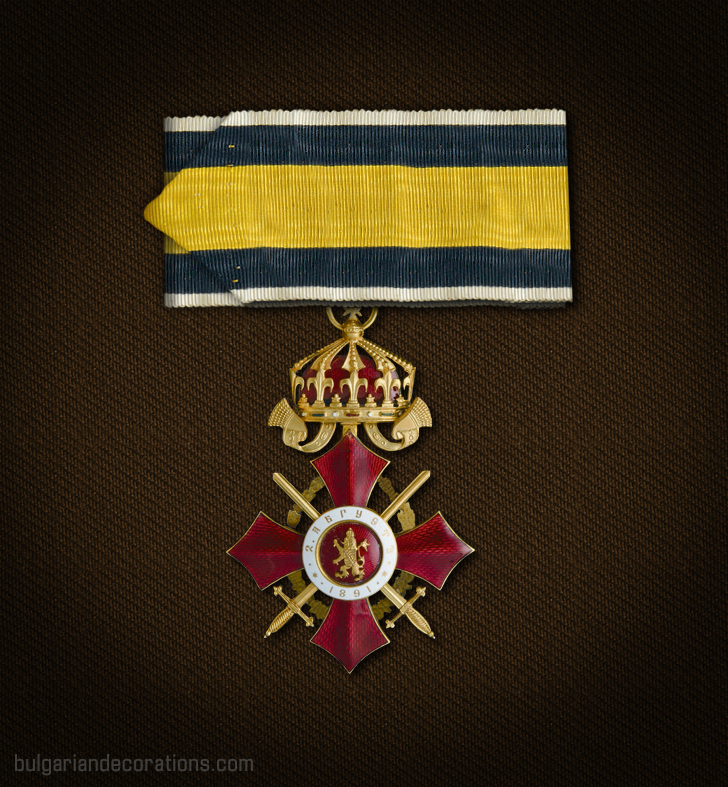 The Officer’s cross represents a 48 to 51 mm gilt-rimmed cross, worn suspended from a triangular ribbon with a rosette (unless when suspended from the sky-blue wartime ribbon) and worn on the left side of the chest. Among the people decorated with the IV class were majors and captains, in regard to their position. The fifth class represents a cross with the same shape and dimensions as the fourth class, but instead of gilded, the rims and body of the cross is made of silver or silvered. 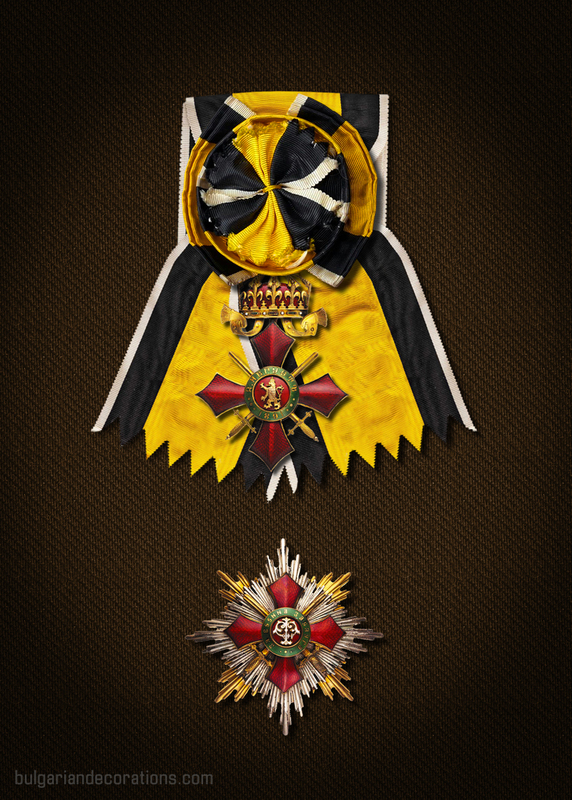 Unlike the higher classes of the order, the fifth class can be awarded either with or without a crown suspension, thus splitting the class into two variations. The fifth class was suspended from a ribbon folded in a triangular shape without a rosette. This class was being awarded to platoon commanders - from lieutenants to NCOs and occasionally to war veterans. 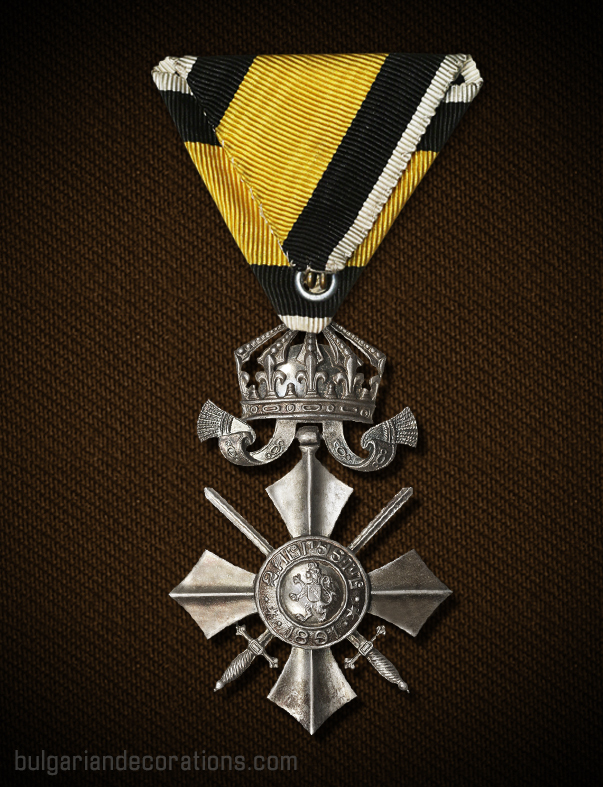 The lowest class of the Order of Military merit is the so called silver cross. It represented an apr. 46 mm wide cross made entirely of silver or another metal alloy/silvered. It did not have any enamel either on the obverse or reverse, nor the so called wartime distinction wreath. 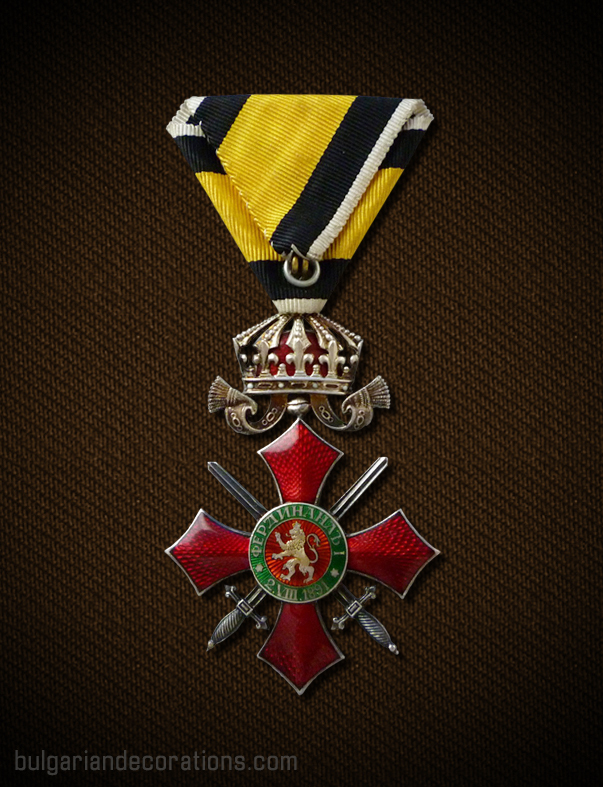 Similarly to the 5th class, the silver cross could also be awarded with or without crown suspension. The ribbon was a triangular one, without any band or rosette.